Changed avatar, changed header of the blog, got a facebook account for crafting things. Now it’s time for the last post of tonight. Sorry for spamming you guys (or rather, girls, mostly), but I like to have all things I make on the blog, it’s also some sort of crafting diary. As said in the previous post, now it’s time for two lovely vintage cards with FrenchKissed images in the center. I loved this lace-lady ever since I had seen her in the shop. My printer doesn’t do her justice. Lots of layering of stencils and stamps on the surrounding card, with Chocolate Baroque butterfly, Sizzix flower die, probably also a Marianne design die, the text is a clearstamp from …? (a well known brand too). I’m not sure if the thistle stamp is Chocolate Baroque or not, I did buy it there, but it was part of a grabbag so I don’t know from which set it is or if it’s even CB. The swirl in the upper right and bottom left is a free stamp I got when buying stamps at a dutch stamp store (I think it was at a crea-event, so can’t remember which store). There’s also a peacock feather on it (clearstamp, probaly cArt-us), a TCW stencil (tree branches) and a reverse image of a stencil (the turqoiuse bit). Think I mentioned it all now. … let’s head on to the next card! The background was originally for a CB colour challenge, but I didn’t like how it turned out. The white stamping wasn’t really as crisp as I hoped. So now it would be a background paper. Other stamps used are from Prima Marketing – Pixie Glen collection. The main image is FrenchKissed postcard again. I stamped the roses, clock and banner on the card, then stamped again onto other cardstock, coloured, cut out and glued on the card. It’s a busy card, has a vintage feel to it, but it’s also my style of card, not too vintage-y with lots of added 3d flowers and lace. This vintage card still fits flat in an envelope with normal postage ;). Stop wasting time – Life is now. That is the line I wanted to use on my card. Or something along those lines: Wasted time – life is a present / life is present. Waste of time. A while ago I ordered a grabbag of VivalasVegastamps along with a few I chose myself. In it were some stamps I’d never use as they don’t fit me, and I thought this one was one of them. I couldn’t for the life of me imagine a card with this stamp, as the image reminded me of a Beverly Hills “I’m important”- type person who doens’t have time for you, so why would I use it? I had negative feelings toward the image. That is why I thought along the lines of “wasted time”. The image in question is that of the woman calling. It’s impersonal, as it’s not you she’s calling with. It’s like you are watching someone who is on the phone, and who is completely ignoring you. At least, that’s how I saw it. But, what would I do with a card that was so negative? I’d certainly not send it to someone. That is the problem with several quotes I like as well, who do you send them to? So I thought about a possible use for the image, as I had stamped it. It’s about connecting people. Maybe: Time for an update? But that is stupid, why send a card, suggesting the other person call you and give an update? Why not call myself? So it had to be: Time for an update! As a card instead of a call. The exclamation mark is a bit lost sadly. Alright, time to show the card. I added the Dr. Who telephone boot as a bit of a joke. (ok, it’s mostly a regular telephone boot, but that’s not what I thought when I saw the stamp image) (this was one of the stamps I selected from VivalasVegaStamps). The phone booth is stamped with Versafine grey, the main image and text with Stazon Jet Black (it’s faded a bit, eventhough I reinked it) I didn’t want to glue the image down onto a plain white card, and didn’t want to layer it. So I added a pattern to the card, and to give it more of a friendly and talk-between-friends feeling I added the teacup from the Pixie Glade stamp set from Prima marketing with Stazon Jet Black. Oh, and the shading is done with a distress marker onto an acryllic block and applied with a waterbrush, inking the edge is done with the marker directly and then quickly go over it with a waterbrush (dipped in a bit of black sooth distress ink fro mthe block). This is my second entry for the Vandicrafts Artistry Challenge #14, Black and white. Oh I did start making black and white christmas cards, but they’re not finished yet and won’t be finished on time. So I sort of stuck to my intention to make each card a christmas card. And now, for my own pleasure, a picture of one of my best creations ever. an And here is another adorable picture of an adorable boy. He’s mine, so ofcourse I find him very very cute, pretty, sweet and perfect. I’m not much of a babyperson unless they’re mine, so no harm done if you don’t think he’s adorable. (Though don’t tell me please :P). No, we don’t celebrate mothersday now, it’s just that I still got several cards I haven’t posted yet. Which is ok, as I hardly have time to craft the past few weeks! So I still have some cards left to post. Here are 6 cards, probably made more then 6 months ago. Some lovely papers -turqoise acryllic paint on paper, then embossed with inked up embossing folders – which I still haven’t used! First and second card. I learned from the first. But not enough to not mess up the 2nd card after this picture so horribly I threw it out (I think). Playing with the Designs by Ryn stamps which I just got then (I think). The lady was part of a grab-bag of Chocolate Baroque, and it was only after stamping that I noticed the fish in her cape. I still have this card, didn’t find the right occasion yet. I love the card, I love this Hero Arts stamp. I had the fairy for a while, but don’t actually use here so often. She’s embossed with rangers distress embossing powder shabby shutters. The raindrops were then also just newly received from Designs by Ryn, I love how it looks like she’s in a garden, and I love the sizes! IT jus t matches very well. Looking at it in a digital way now, (You know, on screen…) I think I should make more of these cards. I love the frame, the fairy, the drops, and they match together perfectly! Also used on this card: Patio Stone. With that, I conclude this post of 6+months old cards. It was fun making this card, it was a bit different from what I usually make. I started out with a page from an old thin book for people who start learning english. The paper is a bit more fragile then my usual paper so I had to work a bit more careful. I refound my sizzix flower dies, and had fun using them on fabric! Fabric? There’s no fabric on the card! That’s right, but I only decided against using the cut out fabric after the inkin/masking, when I tried them on the page. It didn’t look right. I look forward to using my dies on more fabric scraps. I masked both the negative and the positive cut of the die-cut, which gave a nice layered effect. I seem to be in love with the Persimmon orange colour from distress in combination with blue (Peacock Feathers is still a favourite!). Then, time for the words. 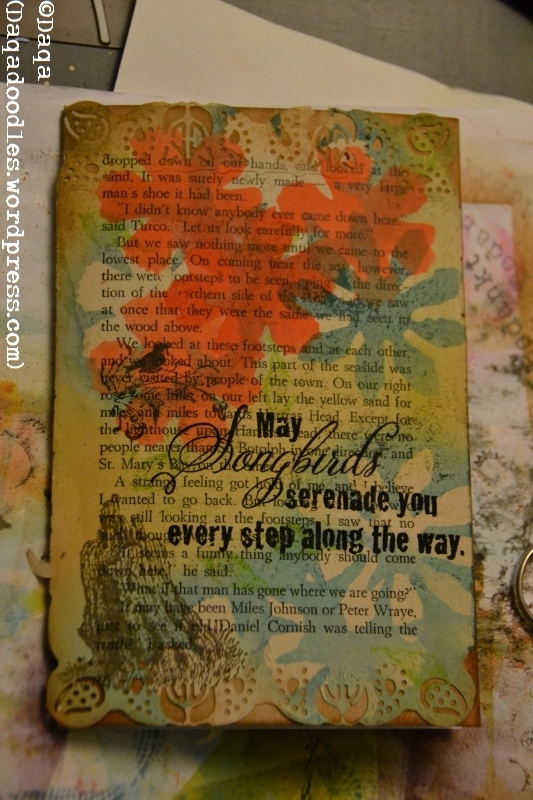 “May songbirds serenade you every step along the way” has a very poetic feel to it, it matches the page very well. Also, there are a few times when the word “footsteps” jumped out of the text – some are hidden in the end result though. I think on this page they are tracking someone, or following a path (I did read the short story back when I checked if this book could be used). Songbirds singing from between the flowers, lovely! I stamped with versamark+stazon jet black and embossed with black embossing powder. Next was adding some more diecuts, and I set myself to the challenge to use some of my scraps of paper. I did find some good matches. I also stamped a bird from Prima Marketing Pixie Glenn with Stazon Jet Black, and Non-Sequitur’s Tree Trunk with brown. Last, I die-cut the tattered flowers from tissue paper (after colouring the tissue paper with distress ink and water and drying it). But that’s not all, I took my M-bossabilities folder Twigs and Tweets, inked up a part of it (and removed the ink on the leaves, leaving only the birds to be inked reddish) and embossed the flowers. So on every tissuepaper flower there is also a bird (or part of a bird) inked, and the embossing of the folder itself. In the end I didn’t use all 4 diecuts, I only used 2 and inked them up a bit, made them a bit greener as I thought the red was too red. The branch is stamped on with a stanp with versamark and then heat embossed with shabby shutters distress embossing powder. The little die-cut birds from Marianne Design are inked up with versamark with a brush, and then dipped in embossing powder. I used a Cheery Lynn die (Celtic Frame I think it’s called) to partially cut the top and bottom of the page. Before gluing on the die-cuts I wanted to put a little bit more protection on the page, so I put decoupage glue on it. I was a bit slow in thinking, because only after rinsing the brush (which I do immediately after using the glue) I realized I ofcourse could glue on the die cuts now easily as well. No fussy gluing with small bits, as the entire surface of the card was sticky. I did end up having to add a bit of glue to some parts where it was too dry allready, but none the less it was fast and easy to add the diecuts. 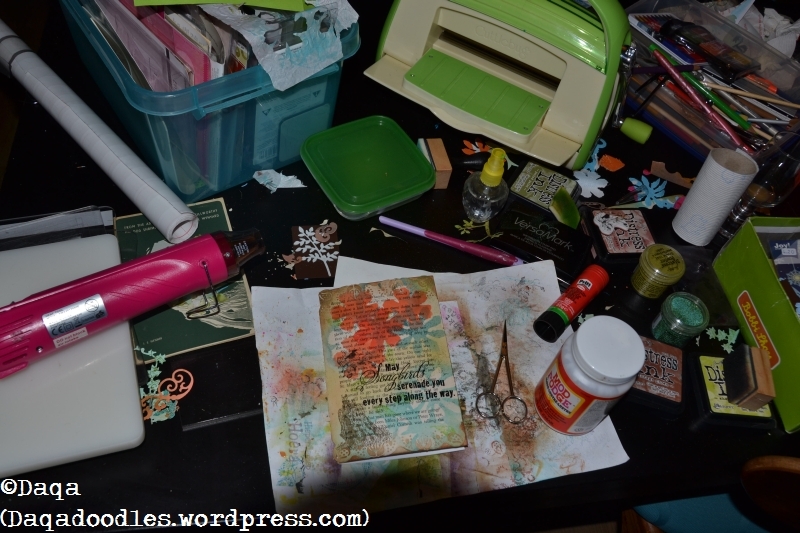 Before adding decoupage glue – would it ruin the card by smearing out the ink? Also visible, on the right: die-cut fabric tattered flowers (blueish) and the flourishes die (and cut), inks and oh the antique greenish embossing powder! Love it! That about sums it up. (I didn’t describe all steps, it’s obvious I inked the edges and matted the card onto cardstock etc). Distress inks, (distress) embossing powder, stazon, decoupage glue, tissue paper, old bookpage, scraps from the scrapheap. I was inspired by that technique and tried it out myself. Well, inspired… To be sure I did it right I copied her card, maybe with a change of stamp, colour and/or text, but I’m sure the layout is the same. I do know I had a flower branch off from the side, to emphasize the text: Enjoy the little things. It’s that one flower in all that green, that one branch being out of line, that you can enjoy. See it, and enjoy it’s unrulyness. It’s will to be seen. I had a conversation with a neighbour that week or a week later, who said she had a hard time as a friend had passed. She said she admired how he could enjoy and appreciate the here and now, the things around him. He enjoyed their walks together, enjoyed the park, the trees… we both agreed people should stop and take the time to see things around them and to appreciate / enjoy them. I thought of this card, and how very suitable it was for this situation. It was like it was meant to be. Rarely do I make simple cards, as I just can’t stop decorating and such, but I had this one simple card. This one card, not overly joyful or ful of happiness, but this solemn card of peace and hope. A card that fit with dying and life. I didn’t take that many pictures as I still didn’t think it was perfect (I think it’s obvious to see what I meant), but it was perfect for the occasion, and very very well received, she had needed it. So I am thankfull for this imperfect card, and Cornelia’s inspiration. Ah I made it in May, I see from my order. 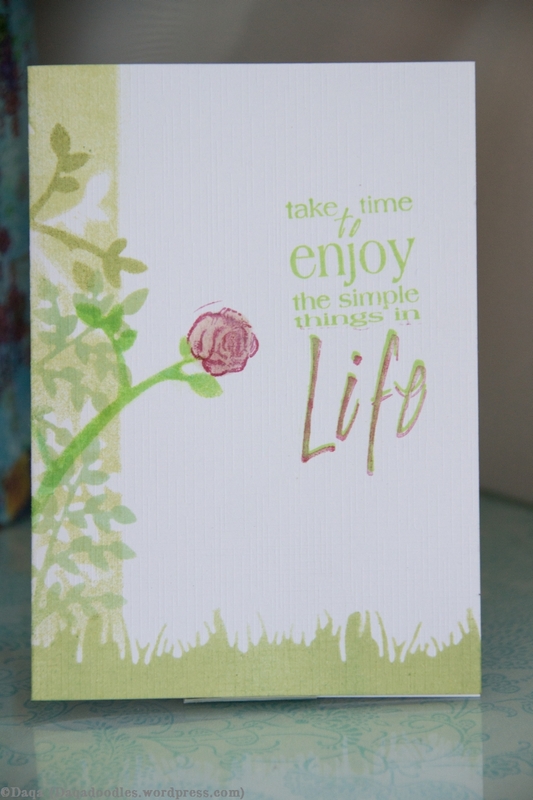 I used the ink and textstamp I ordered from the stamping cottage, and I bet the grass border was fairly new as well – it was made by die cutting a grass border with Joy Crafts! 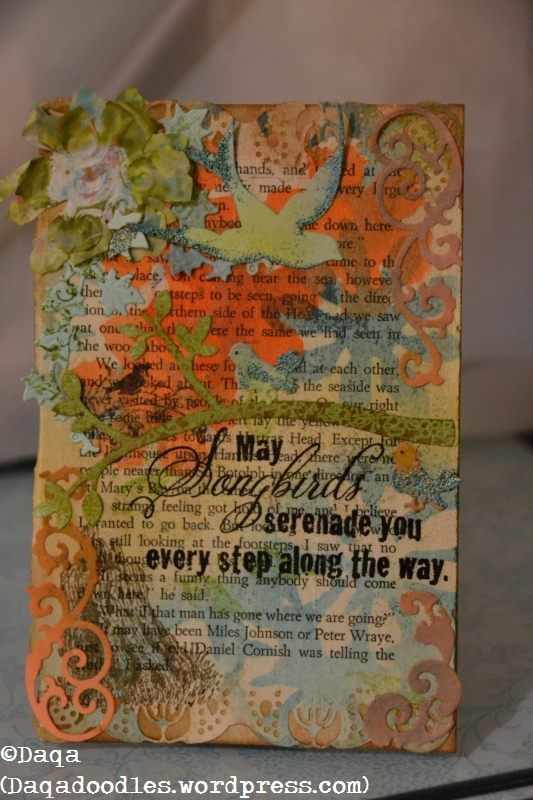 Grass border die, then using the left over cardstock as a mask. The branch that is sticking out is a Marianne Design die (or rather, the negative of the die is used as mask) and the other branches are a Joy!Crafts vintage flourish die (both the diecut and the negative of the diecut used as a mask). The rose is from the set Pixie Glen by Prima Marketing (#551087, I looked it up). The stamping cottage – Challenge #2: make your own background and use flowers – (ends in 2 or 3 days) I do hope one little simple flower counts! Hmm but this isn’t really a background, is it? If it doesn’t count, then it’s ok, I’ll try again next time! Still, I would like to spread the word of the challenges, so I’ll post this anyway. Even een stukje nederlands: Volgens mij voldoet mijn kaart niet aan de criteria, er is niet echt een grote achtergrond (het zijn meer randen) en er is ook maar 1 klein bloemetje. Ik heb gewoon te weinig tijd om nog een nieuwe kaart te maken voordat de challenge afgelopen is, en ik maak de challenge graag bekender, dus ik stuur deze kaart toch in. Maar disqualificatie is niet erg hoor! Als ik niet aan de regels voldoe, voldoe ik er niet aan. Zo simpel is het. Argh the other card I’ve got with a beautifull selfmade background and stamp that fits the requirements doesn’t really have a flower on it (well it does, but it’s not the focus). Unfortunately I won’t have any time this weekend for cardmaking, but now I’ll know there is a challenge at the stamping cottage.